Damn Yankees! is a 1958 musical film made by Warner Bros. based on the 1955 Broadway musical of the same name. The story is a modern take on the Faust legend involving the New York Yankees and Washington Senators baseball teams. The film was directed by George Abbott, as was the earlier stage version, with assistance from Stanley Donen. With the exception of Tab Hunter in the role of Joe Hardy (replacing Stephen Douglass), the Broadway principals reprised their stage roles, including Gwen Verdon as Lola. The film was released in the United Kingdom under the title What Lola Wants, to avoid use of the word "Damn" on posters, hoardings and cinema marquees. It was also possibly because the title's pun, alluding to the American Southerners' colloquial term for Northerners ("damn Yankee") would be lost on foreign audiences. Joe Boyd is a middle-aged fan of the unsuccessful Washington Senators baseball team. His obsession with baseball is driving a wedge between him and his wife, Meg—a problem shared by many other wives of Senators supporters. Meg leads them in lamenting their husbands' fixation with the sport ("Six Months Out of Every Year"). After seeing his team lose yet again, Joe rashly declares that he would sell his soul to the devil to see his team beat the Yankees. No sooner has he spoken than the devil appears before him in the guise of a suave conman, Applegate. Applegate claims he can go one better—he can restore Joe's youth, making him the player who wins them the pennant. Joe agrees, but persuades Applegate to give him an escape clause. Applegate declares that Joe can back out at any time before the last game of the season—afterwards, his soul belongs to the devil. With tremendous home runs and game-saving catches, Joe leads the Senators on a long winning streak into pennant contention and becomes a national hero. Joe misses Meg dreadfully, however, and keeps sneaking back to his old neighborhood for a glimpse of her. Realising this could ruin his plans, Applegate summons his demonic right-hand girl, Lola, a seductress who was once known as the ugliest woman in her territory, but sold her soul to Applegate in exchange for eternal youth and beauty. She is ordered to make Joe forget his wife, a task Lola is confident she can carry out ("A Little Brains, A Little Talent"). At the hearing, Meg and her female neighbors arrive as material witnesses, attesting to Joe's honesty and falsely claiming he grew up with them in Hannibal. The commissioner acquits Joe, but as everyone celebrates, midnight strikes and Joe realizes he is doomed. Applegate has planned for the Senators to lose the pennant on the last day of the season, resulting in thousands of heart attacks, nervous breakdowns and suicides of Yankee-haters across the country. He is reminded of his other evil misdeeds throughout history ("Those Were the Good Old Days"). Late that night, as the public wonders why Joe Hardy has disappeared, Joe Boyd meekly returns to his house. A tearful Meg hugs him and they sing to each other ("There's Something about an Empty Chair"). 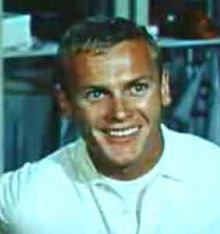 Applegate materializes once again and offers Joe the chance to resume being Joe Hardy in time for the World Series; he also makes Lola young and beautiful again to tempt Joe. Joe ignores him, and a tantrum-throwing Applegate vanishes for good. Reviews from critics were generally positive. Bosley Crowther of The New York Times wrote that Verdon's performance was "one of the hottest and heartiest we've seen years ... Miss Verdon has the sort of fine, fresh talent that the screen badly needs these days. But lest she seem to be the whole show, let us hasten to proclaim that there's a great deal more to 'Damn Yankees' than this wonderful red-headed dame. Like the George Abbott stage show before it, it has class, imagination, verve and a good many of the same performers who did so charmingly by it on Broadway." Variety wrote: "That 10 of the top 11 players, plus creators from writer to costume designer, have been transferred enmasse from Broadway just about insures a film that is as least as good as its stage counterpart. What stands out like an inside-the-park home run is the skill and inventiveness with which the film is coated, thus making 'Damn Yankees' a funny picture." Harrison's Reports called the film "a generally entertaining show even though it does not rate a rave notice. In treatment and presentation it is, for the most part, very much like a photographed stage play, in spite of the fact that the camera allowed for a wider range of activity." Richard L. Coe of The Washington Post wrote of the play's transition to the screen, "It could be argued that perhaps it follows too closely, that this is too clearly a photographed stage musical. That I didn't mind in the least, because 'Damn Yankees' is a swell musical comedy and I'm a sucker for musical comedy." John McCarten of The New Yorker found Walston and Verdon "just as delightful" on the screen as they were in the stage version, adding, "Although expository dialogue occasionally hobbles the proceedings, 'Damn Yankees' is for the most part commendably brisk, and the music and lyrics, by Richard Adler and Jerry Ross, are uniformly lively." A somewhat mixed review in The Monthly Film Bulletin praised Verdon as bringing "great presence and a neatly sardonic humour" to the film while describing the score as "pleasant but unmemorable," and summarized the picture as "a musical made with a great deal of verve and some wit, but without much natural gaiety." Most of the baseball action was filmed at the Los Angeles version of Wrigley Field, a site often used in the 1950s for Hollywood films about baseball. The film contains footage of the famous left field wall of Griffith Stadium in Washington (home of the Senators)—and the house that protruded into the center field area—which gave author Douglas Wallop the plot device that allowed Joe Hardy to escape from the ballpark. In 2009, Craig Zadan and Neil Meron attempted to produce a remake for New Line Cinema, with Jim Carrey as the Devil and Jake Gyllenhaal as Joe Boyd. Lola was never cast, and the project has been postponed indefinitely. ^ "Damn Yankees - Details". AFI Catalog of Feature Films. Retrieved June 24, 2018. ^ Fitzsimmons, Lorna, ed. (2008). Lives of Faust: The Faust Theme in Literature and Music. A Reader. New York: Walter De Gruyter. p. 12. Retrieved 11 July 2017. ^ Crowther, Bosley (September 27, 1958). "Screen: 'Damn Yankees'". The New York Times: 12. ^ "Damn Yankees". Variety: 6. September 17, 1958. ^ "'Damn Yankees' with Tab Hunter, Gwen Verdon and Ray Walston". Harrison's Reports: 148. September 13, 1958. ^ Coe, Richard L. (September 26, 1958). "'Damn Yanks' Is Still Swell". The Washington Post: C8. ^ McCarten, John (October 4, 1958). "The Current Cinema". The New Yorker: 158. ^ "What Lola Wants". The Monthly Film Bulletin. 25 (299): 152. December 1958. ^ Gans, Andrew. "Carrey and Gyllenhaal to Star in Contemporary Film Version of Damn Yankees". Playbill.com. Retrieved 19 January 2017. This page was last edited on 7 April 2019, at 14:36 (UTC).